I’m a few days early but I wanted to share my patriotic front door basket. This is a departure from my normal round wreath. I’m trying to think outside the box more and try different things. I sort of like the way this turned out so I guess maybe I’m on to something. I’ve had the basket for years. It’s been hanging in my basement with plastic ivy in it just waiting for me to give it an update. I lined the basket with Press N Seal and then stuffed it with florist foam. I stuck the flags in first. Next I put in the white flowers, then the red and finally the blue. At this point it really needed something but I wasn’t sure exactly what. I wanted to tie it into the ivy trees in my planters but I SO didn’t want to use faux ivy. Now keep in mind I did this the day before my Ensign Kaitlyn party and I was running around like a crazy woman trying to get things done. The easiest thing I could think of was to use real ivy. I found 2 little plastic prescription bottles in our recycling bin. I punched a hole in the bottom of each one and stuffed them with dirt. 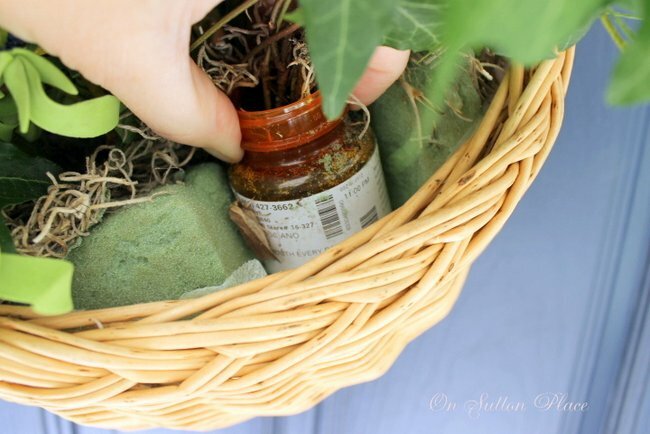 Then I plucked some ivy vines from the planters and pushed them into the bottles. I jammed the bottles into the florist foam and Voila…it was finished. Now all I have to do is remember to water it! This is probably my favorite door decoration yet! BEAUTIFUL! 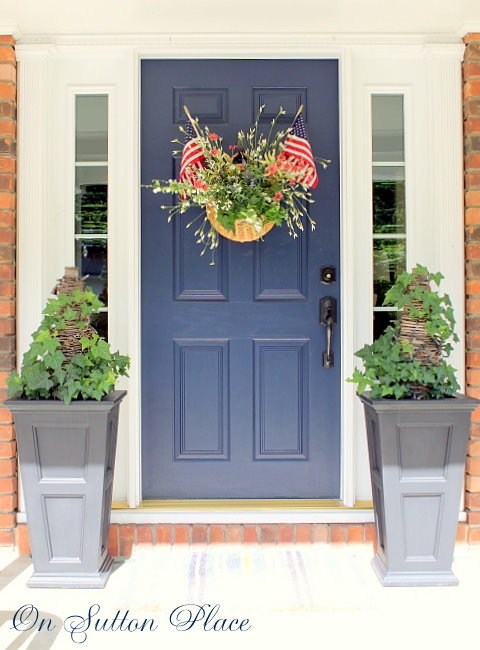 Your front door is always fabulous! This just might be my favorite one yet! Ann, I love this door decoration for July. Glad you found a new use for your basket. Such a nice change from a traditional basket. Pretty with just the right amount of patriotic! Thanks for sharing. This is just so beautiful! We are going to feature this today on our Patriotic Round-Up! Beautiful! You have motivated me to decorate my front door. I love how you decorated and used the flags. The look is just perfect. Great job. 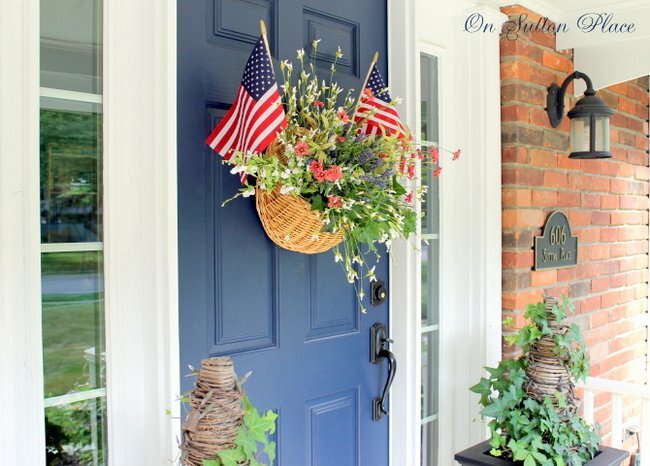 I so love the patriotic door basket…Looks wonderful especially against that gorgeous door color! Your basket on your door is beautiful! If you ever decide to sell those in your Etsy shop, I would buy one. I could never create anything that pretty. Actually, I just love the entry to your home. The twig tree with ivy and lights in the planters are to die for. Love it, love it, love it !! Absolutely perfect for the 4th…the little white flowers look like fire works. Soooo cute! This is a beautiful front door treatment. Very patriotic! It looks fabulous on your front door. 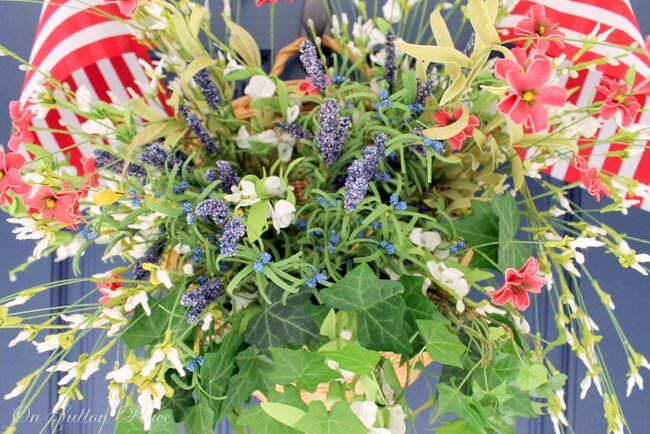 Ann, Please join TUTORIALS TIPS AND TIDBITS WITH THIS GREAT FRONT DOOR DISPLAY!!! BTW… YOU WERE FEATURED THIS WEEK AT TTT! THANKS! Great front door for July, I just finished my door decor but haven’t posted it yet. Now after seeing how beautiful yours is, I’ll get my post ready. Thanks for the inspiration. So festive on your front door – love it! That looks wonderful, Ann! It looks great against your door, too. 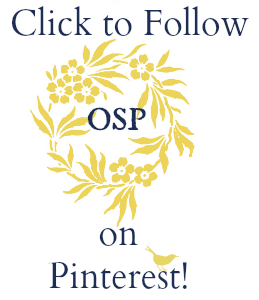 This is such a fun change from a wreath! 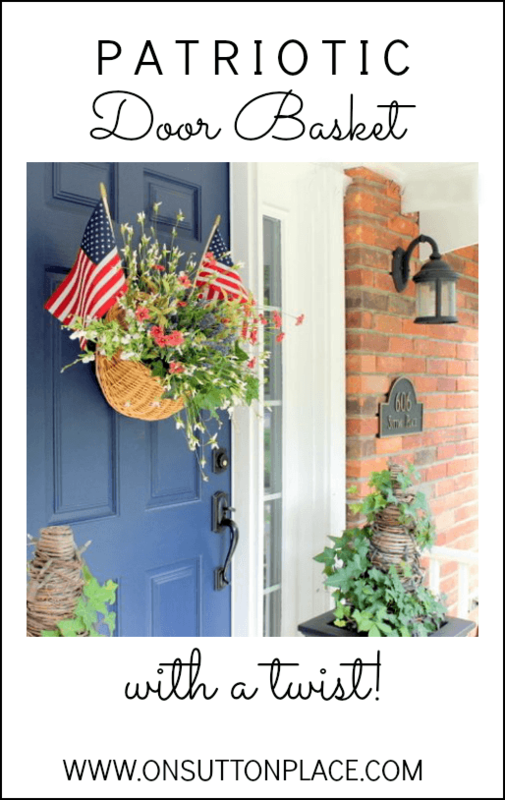 I love how your patriotic front door! Thank you for signing up for the “Snow in July” party, Ann. I emailed you a response, but still wanted to stop by in case you miss that. And don’t worry, I’ll stop by to remind my guests that week. Can’t wait to see what your amazing creative mind comes up with. This is really pretty, Ann. I love it. Perfect! Sort of similar to my front doors and front of the house!!!! Love it! Ann this is just beautiful I adore this basket. You do such great work. Ann, you know I’m waiting with baited breath for the post about the blogroll! Hip, hip, hooray for your red, white, and blue basket! LOVE it and I’m going to pin it! Love it! It looks like a 4th of July explosion! 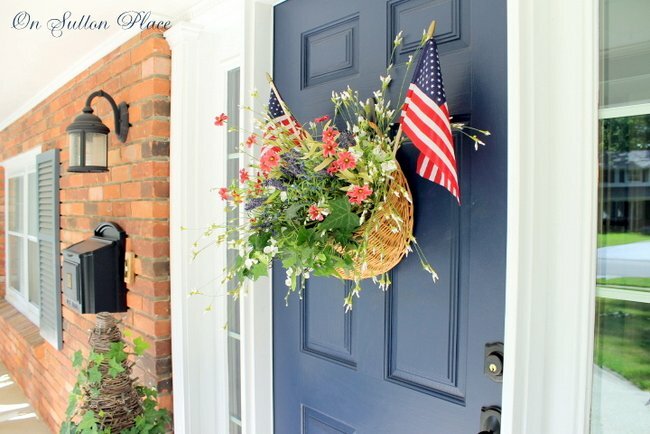 OMG Ann, I love your door with the patriot basket. On my door, I have a basket too with silk mixed flowers from the Cracker Barrel restaurant I purchased in May. I’m going to insert two small flags and display it for the 4th. Thank you for the idea. Love your blog;first one I check each day. Love the basket. I wondered where you went. For some reason blogger won’t allow me to add you to my list. So I guess I have to go in the back door. I love it! It’s so much prettier than a traditional round wreath. It looks fantastic against your blue door too.